Nottinghamshire stalwart Paul Franks will be helping England prepare for this summer’s Investec Test match against South Africa at Trent Bridge. For the county’s popular assistant head coach has been invited to assist with pre-match practice for the second Test, which runs from Friday, July 14 to Tuesday, July 18. And the 38-year-old Franks, who played a one-day international for England back in 2000, says he is only too happy to serve his country again. “It came as a pleasant surprise,” he said. “But it’s a wonderful opportunity to see England’s best prepare for what’s going to be a very exciting series. “I’ve heard lots of good things from players and coaches alike about the current England coaching and management set-up. “The team are obviously in a very good place and if I can add anything, and I’m hopeful I can, it will be a great experience. Franks has been at Trent Bridge since 1996, both as an all-rounder who helped the club to two County Champinship titles, and as a progressive coach. He believes coaching with the Outlaws is very much about helping players fulfil their England ambitions, as well as winning games of county cricket. 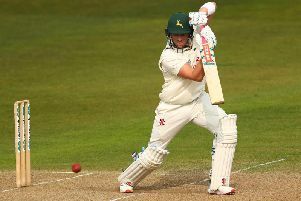 “I don’t think there’s a player at Nottinghamshire over the years who’s not wanted to play for their country,” he said. When the England juggernaut rolls into the East Midlands, the onus is on the hosts to make the venue a home-from-home for the national team. Everything from practice facilities to net bowlers, dressing rooms and helping manage the media goes into the mix. It’s all part of the service according to Franks, who sees his forthcoming role as an extension of that welcome. “It’s something we pride ourselves on, “ he added. “We want to add value to the England team when they come to Nottingham. “We take pride in the fact that they enjoy coming to Trent Bridge. We want them to enjoy the experience and give them every chance to succeed. “That’s from the welcome they get to the facilities we provide and the people who help them prepare to do their jobs.